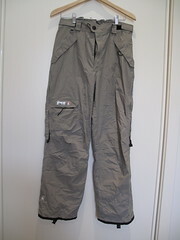 I finally got all the snow clothing out of the cupboard on the weekend (one of those jobs I have been avoiding) and put it all on eBay. All that is except the pair of men’s pants that had a hole in the leg and a ripped lining – I don’t know why I hadn’t already tossed them out- and 2 pair of goggles that the foam fining had perished while stuck in the cupboard unused. The auctions are going well 5 out of 10 things already have bids on and anything that doesn’t sell will be going to the thrift shop. While writing this I realised that I forgot to put the other pairs of goggles on eBay so I had better take care of that shortly. I think there may be another jacket in my son’s closet as well so I have better check that out. That certainly freed up some room in one cupboard. I don’t know why I had been avoiding this job for so long but it is a good thing I decided to do it now because Australia is about to move into winter and the ski season will be starting soon so now is the perfect time to put ski gear on eBay. That is a good tip to remember – Consider the seasons when selling on eBay some things will sell better at certain times of the year. These are the pants I had to toss because they were torn. Thanks for the inspiration to get rid of clothes. I often decide to keep old things around so I can wear them when around the house, but now I have way too many clothes for that purpose. I threw away an old pair of pants and an sweater with a worn out elbow today. Good for you Wendy. Before I started this project of 365lessthings I had already culled my clothing down to a reasonable amount and when I buy clothes I have a “LOVE IT” policy, that is when I try it on if I don’t love it I don’t buy it. It eliminates the possibility of wearing it twice and deciding it really doesn’t fit right, look good on me or suit the purpose for which it was bought. Plus I only buy clothes when I need them.